Speaking with the Official PlayStation Magazine (September 2018, issue 152), Stanisław Święcicki, who’s been a writer at CD Projekt RED since 2013, talked about the writing team size for Cyberpunk 2077 and the creative process behind it. It’s around eight to ten people. Ten at the moment. So, it’s quite a team. At the beginning it’s like all the team sort and on a higher level it’s decided what’s the direction. And then we come up with sort of a story outline so to speak – a very bird’s eye view of how the story progresses. Narrative is key at CD Projekt RED. I like to say narrative is key, rather than story is key. Because it all comes down to all the narrative teams really working closely. Every department has a different focus: whether everything is logical, whether it works as levels, how good the cinematics and the mood of the scene is. Then it comes back to us and we organically change the scenes in that way, as the other teams suggest. We write the dialogue, it comes back to us again. So, it’s really a multilayered process. We use the mythos as a strong road sign for us in terms of mood and atmosphere because we’re making a similar universe to what you`ve seen in 2020, but we are giving ourselves the creative freedom to do major tweaks to what the universe is, and what rules it has. That’s sort of needed because Cyberpunk 2020, which I played as a role-playing game, was pen-and-paper right? So we’re making a very different game over here. But for us it’s really about the mood and what’s important about the world. 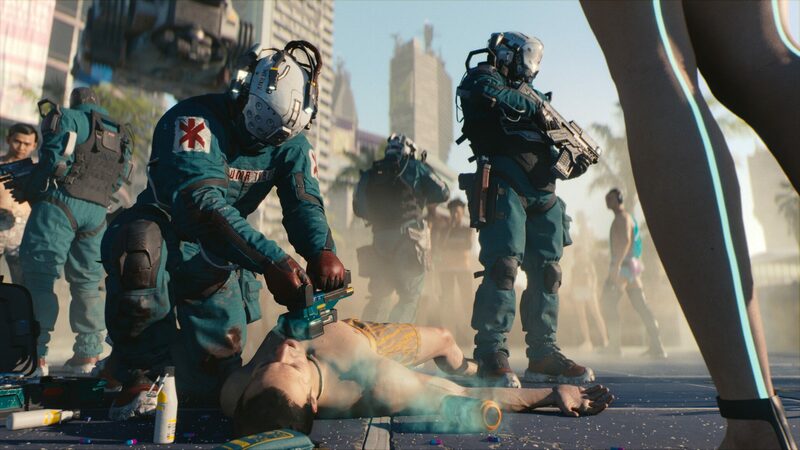 Święcicki also discussed the lore and characterization of the gangs in Cyberpunk 2077: according to him, they won’t be mere comic book-esque villains. The moment when trauma team is descending – I was on the team writing that. Trauma team and the meat wagon sort of mythos – so, you know, really tough guys in ambulances flying around, but also armed to the extent that you can’t really call them health care workers, They’re super-dangerous to be on par for this world. The moment when they descend it’s like ‘All right, yeah, this is the vibe I used to imagine’. And also the machine gang you make a deal with. With the gangs we really want to emphasize that we don’t want them to be our comic book-esque villains – they’re not abominations that decided for almost no reason to put cyberware in themselves. It’s a dark, dangerous world and some people who aren’t able to make it to the megacorps or don’t want it… It’s a human need to seek identity, and some people just gravitate towards the gangs. Although their faces are modified they’re still human underneath, you know. It touches upon a universal feeling we all have: the need to belong to a group. Cyberpunk 2077 doesn’t have a release date, though we’ll let you know once it does. Still, CD Projekt RED will showcase a new demo later this month at Gamescom 2018 to the press – stay tuned for more on that.